Nuestro nuevo 33 'Springdale remolque se encuentra en el lado opuesto de la propiedad con vistas al río y tiene la privacidad de la casa de alquiler. Se encuentra justo por encima del río y la derecha por el camino de senderos de conservación y Parque Nacional North Cascades. Los huéspedes tienen acceso al pozo de fuego, barbacoa y todas las comodidades del hogar. Remolque se completa con ropa de cama, utensilios de cocina, toallas de baño y artículos de primera necesidad. Everything went the way it was supposed to ! 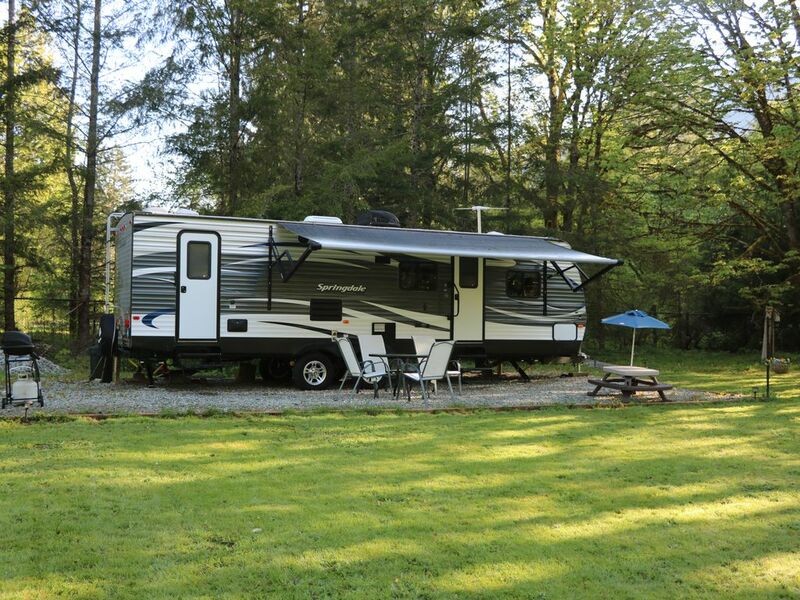 A well-maintained RV with pop-out, it's very comfortable. There is a large, acre-plus lawn that leads down to the Cascade River, bordered by large maple trees with Adirondack chairs and benches here and there. Very picturesque and restful for us. You could also play games, etc. near the RV if you wanted. We enjoyed our stay. Property is well kept and it was great being right on the banks of the Cascade river. Location was ideal for us with the close proximity to NCNP, which was the reason for our visit. The Camper was well suited for the 2 of us for our week long stay. The owner and staff were very responsive when we needed them for anything. We hiked in NCNP every day, despite less than ideal weather. I only mention the weather because the rain during our stay kept us inside the camper when we returned at night - fine for 2 adults, but would maybe have been a little cramped for larger groups. On a positive note, we did have one night without rain and clear skies - the remoteness of the local area and lack of light pollution really brings out the stars. We would definitely stay here again. This is the perfect location for anyone who wants to visit the National Park. It was so much fun to stay in the camper. The property is in a beautiful location directly on the river - we sat by the river in the evenings watching the salmon and the deers who came by to eat from the apple trees. We picked blackberries right on the property. It is just down the road from some of the best hiking in the Park. We stopped by Cascadian Farms about 3 miles away for fresh organic blueberries and corn on the cob and ice cream. It's not luxury but it's very comfortable and clean. We had a wonderful time and will miss the little camper on the river (and the two resident cats who stopped by every day for a visit. Amanda, Jason, and Xavier are wonderful and kind. Sad to leave. Hope to come back some day!! The camper was very clean and spacious. As with all campers, it had it quirks. We did have a snafu and the owners were very responsive, helpful and generous.